What Does It Take to Become A Global Fashon Capital? The fashion world is in a period of great flux. We created the Top Global Fashion Capitals™ rankings in 2007 when the global economy was reeling from a number of structural hits from which it has yet recovered. Through our big data analysis of economic trends, we came to understand that fashion was and would continue to be, one of the few bright spots in the global economy. We also came to understand that it was a model of a de-centralized, diversified industry with dozens of little-recognized centers from cities, nations, and cultural traditions. 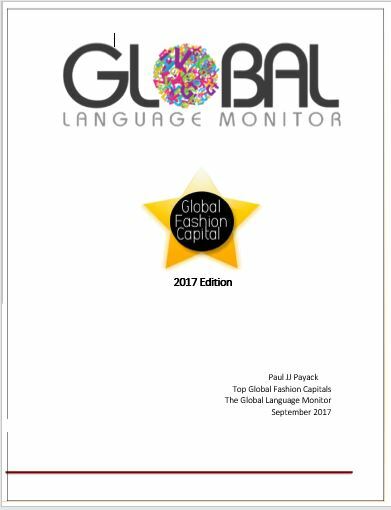 Thus was born our effort to recognize and analyze the Top Global Fashion Capitals ranking them by their brand equity in the same manner as one would rank universities, luxury automobiles, and CPG brands. GLM began with a few test runs and then published our first global rankings in 2007, which included the usual suspects and their immediate competitors, which we determined through global big-data analyses. We then ranked each city against three and then four different categories of fashion from which the final rankings would emerge. Later, once we had gathered enough data, we included a trend-tracking ‘predictive element’ that had been used in GLM’s Narrative and Trend Tracking products and services. The Top Global Fashion Capitals are now recognized as the standard in the fashion world, as you can see below. For the 2017 edition, we are tracking more than three-score established and emerging centers of fashion.